Stradivarius had to work for victory, before coming through well to win a £1m bonus. The odds-on favourite was ridden to a hard-fought victory by Italian Frankie Dettori, who in the process earned owner Bjorn Nielsen a remarkable pay day. No horse had previously won the Yorkshire Cup, Ascot Gold Cup, Goodwood Cup and Lonsdale Cup in the same season. But after coming into Friday’s race with a perfect three from three record, excitement was building that Stradivarius could be the one to break the record and scoop the Weatherbys Hamilton bonus. Led out by Petitioner - also owned by Nielsen - Dettori waited patiently as the race unfolded before making the crucial move on the home straight just as it looked like his horse would be squeezed out. With the finishing post coming into view, Stradivarius pulled ahead of Count Octave at just the right time to take the win with Desert Skyline third. The victory was Dettori’s 21st win of the season while Nielsen was also celebrating in the paddock as his jockey did his trademark flying dismount. 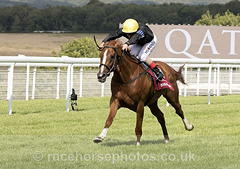 Dettori said: “I ran into a pocket although I didn’t have too much ground to make up. I thought just get him near the rail so he would have something to focus on. “He laboured today. He’s had a very hard season. Sometimes it can take its toll. His class and his courage got him through, he got the the job done. Nielsen will receive 70 per cent of the £1m jackpot with the remaining 30 per cent divided equally between trainer John Gosden, stable staff, breeder and jockey.